After a very long delay myself and my friend Mike got together for a game of Sharp Practice in Rhode Island. It was our first game since last August so I was looking forward to it, as Mike is the only gamer in area (90 miles) who is a TFL fan aside from myself. We had been playing the CoC Martlet campaign, but I really think that I (the British) had little chance of winning more than half way through so we put it aside and decided to have a go a Sharp Practice. I have to admit that I find SP a bit of a challenge; of all the TFL rules I have played I find these have the steepest learning curve. 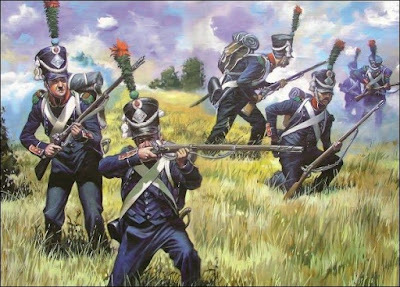 I think I have played two Napoleonic and two FIW games so far but maybe spread over 2 years so I am usually starting anew each game. My last game was in Montreal in August which we really messed up and that was FIW, a less complex game than Napoleonics due to the troops mostly being skirmish types. Mike has quite a collection of Napoleonics for SP beautifully painted by Dani Dunbar. This includes, Brits, French, Poles, Brunswickers and Spanish. Most gamers though like to use their own troops so I brought my Brits. We decided I think on a 80 point base game and we ended up playing scenario 1 in the book giving us a grand total of 92 points. My base force was the Literary Company from the book as was as follows. We actually got to play the same game twice over a period of about 4 hours, which really is pretty good. I have not put together a game reports but here are some photos. The basic setup The Brits are advancing in the foreground. Could not take down the Poles! Well I have to admit to getting slaughtered both games. I am not sure what I did wrong, the first game I think I was just unlucky, the 2nd game started a little better but I just could not get my line infantry in position. In retrospect, I can think of a few things that I could have done differently but it was tough as Mike had 7 leader cards in the deck with 5 command cards while I had 5 and 4 respectively. Anyway it was tons of fun and it was great to game with Mike again. If you are interested in Sharp Practice, Mike is putting on a game at Huzzah in Portland, Maine on the weekend of May 18-20. I am hoping to be there. The way the cookie crumbles sometimes John. As it was not a campaign game then you will be back full strength and fighting fit ready for next time. I continue to find Sharp Practice really, really hard to wrap my mind around, but wow, sure looks cool! Great stuff.